Ann Wilson is one of the volunteers on the GM1914 project at Wigan Local Studies. She has been looking at local newspaper reports during the First World War. Her post makes the link between a local man and what must have been a dramatic experience at sea within days of the declaration of war. At the start of the war information about the war was not headline news. Most of the early newspaper accounts are given over to one page or less. However advertisers made full use of patriotism to both sell goods and enlist volunteers into the forces in the time before conscription was introduced in 1916. A Wigan man, William Johnston of Poolstock Lane, experienced one of the first skirmishes of the war first hand. 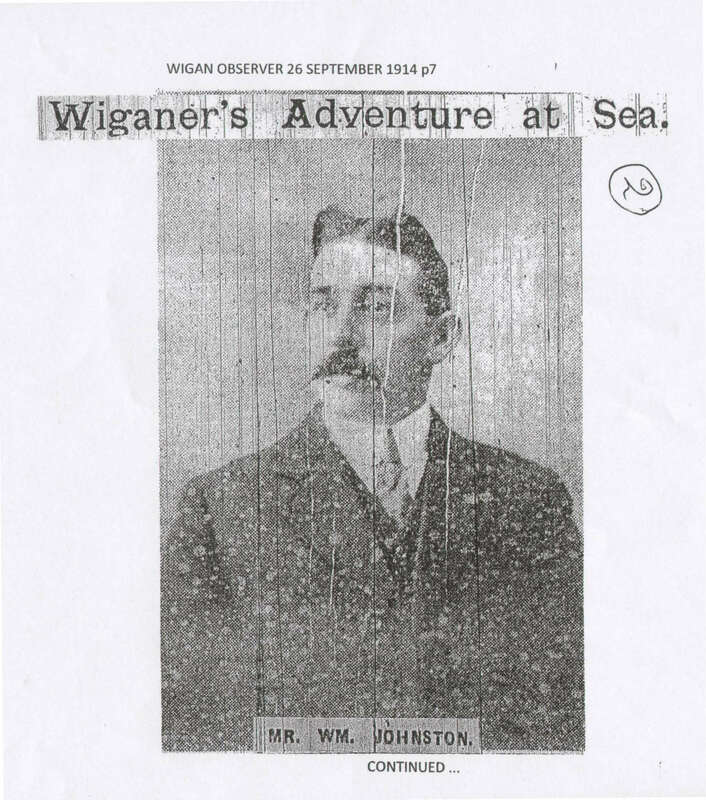 His account of the sinking of the SS “Hyades”, was printed in the Wigan Observer 26th September 1914. He was First Officer on board the ship which was taking a cargo of maize from Buenos Aries to Rotterdam. On August 8th 1914 the “Hyades” received a signal from H.M.S. “Glasgow” telling them war had broken out between Great Britain and Germany. Days later they were ordered to head for Las Palmas. On 15th August the “Hyades” was intercepted by the German cruiser “Dresden”. The captain, not convinced that the cargo was not bound for Britain, ordered that the “Hyades” was to be sunk. The crew and their belongings were transferred to the “Dresden” and the “Hyades” was then scuttled. On board the “Dresden” the crew were shown true hospitality and were treated better than their captors. On 20th August the “Dresden” arrived in Rio de Janeiro and the crew of the “Hyades” were put aboard the R.M.S “Oriana” bound for home. The crew had nothing but praise for the treatment they received from their German captors who, they said, were truly friendly.